Some residents of the Soap Factory apartments, shown here with San Pedro Creek Culture Park in the foreground, have received relocation aid from the city. For five months, the city’s Housing & Neighborhood Services Department (NHSD) has been crafting a policy designed to help residents who have been forced to leave their homes, or who are on the verge of being uprooted. 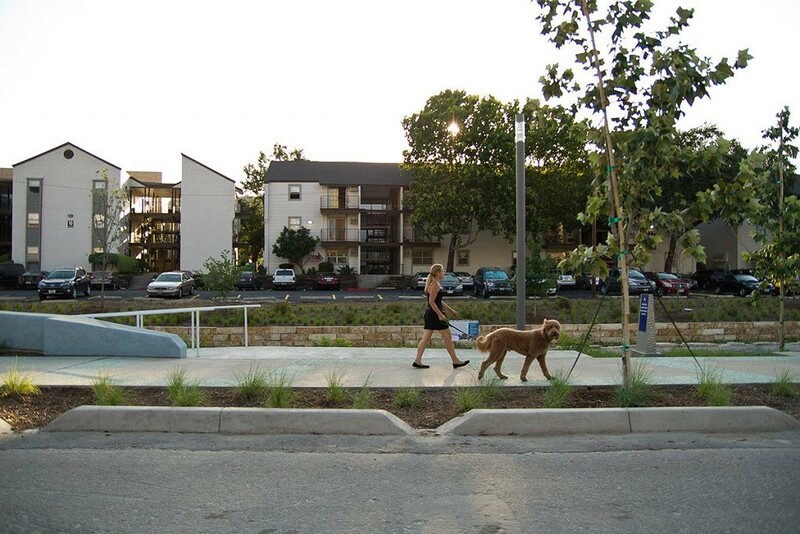 Maybe the residents are experiencing rising housing costs because they live in a rapidly changing neighborhood, or live near a multimillion dollar public project like San Pedro Creek Culture Park, that’s going to make their area more attractive to investors. Perhaps their house is deteriorating, and code compliance violations are piling up; they can’t afford to make the repairs and pay the fines and are forced to move. 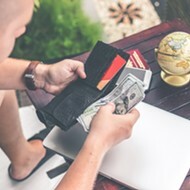 Or maybe the household is suddenly faced with an unexpected expense, such as a hospital stay or car repair, which is hindering their ability to pay the rent. In these situations, the $1 million policy—known as the risk mitigation policy—would kick in and disperse various amounts depending on the situation. For example, if a family was forced to move because its rent increased by a percentage twice the city’s average—which is estimated to be 3-4 percent, based on real estate data the city pulled from CoStar.com—the policy would pay out up to $2,250 or $3,000, depending on their income level. While the policy has been gestating since the fall, some housing advocates and observers have described it as nothing more than a Band-Aid. They say it doesn’t address the root causes of neighborhood change that sparked the displacement in the first place. The policy kicks in when it’s too late, they say, the moment a household is forced to move or just before it gets to that point. NHSD officials have said consistently the risk mitigation policy is designed to address displacement as it occurs, and is not meant to solve gentrification. The process of crafting the risk mitigation policy, which the City Council will consider on March 21, has also raised questions about the definition of displacement in San Antonio. Is the city doing enough to address the situation its downtown housing incentive policy created? The risk mitigation policy is one piece in a larger displacement strategy, Nirenberg and Soto told the Heron in recent interviews. For example, Soto said the city is proceeding with a CCHIP impact study, which will examine how city-incentivized housing developments have either indirectly or directly displaced communities in this area. 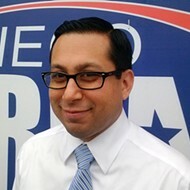 NHSD has also forwarded Bexar County Appraisal District data to the office of state Rep. Diego Bernal, D-San Antonio, who recently introduced House Bill 1102 at the Texas Legislature that would freeze a property’s school taxes if the home was owner occupied for at least 15 years, and if property tax payments increased at least 120 percent during that time. A study initiated by District 8 Councilman Manny Pelaez will examine how the Bexar County Appraisal District values properties compared to other Texas counties of similar size, and how those practices impact San Antonio’s economic development. There are other pieces. 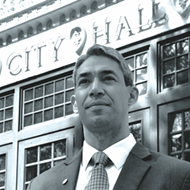 “We’re going to move as fast as humanly possible,” Nirenberg said recently about the big-picture strategy. Downtown resident Maureen Galindo, seen here with her daughter Brigid, now lives at Refugio Place after she was displaced from the Soap Factory apartments last year. After being displaced for the second time in 18 months, Maureen Galindo, 31, has settled into her two-bedroom apartment at Refugio Place, a mixed-income complex built by the San Antonio Housing Authority (SAHA) just south of Hemisfair. Galindo was first displaced from an apartment in southwest Portland, Oregon, when her rent rose from $1,215 to $1,450. In May 2017, Galindo and her three young children left Portland and spent a few months living with Galindo’s aunt in Philadelphia until she decided to move to San Antonio, where housing was more affordable, and where she could attend the University of Texas at San Antonio. In August of that year, the family moved into the Soapworks apartments in west downtown. 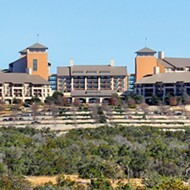 At the time, construction on the $178 million overhaul of San Pedro Creek, which runs alongside the Soapworks properties, had been going on for about a year. The Soapworks and neighboring Towne Center apartments—which are now called Soap Factory—had become prime real estate because of the creek project, similar to the way land along the Museum and Mission Reach portions of the San Antonio River—north and south of downtown, respectively—had appreciated after those sections were turned into linear parks. 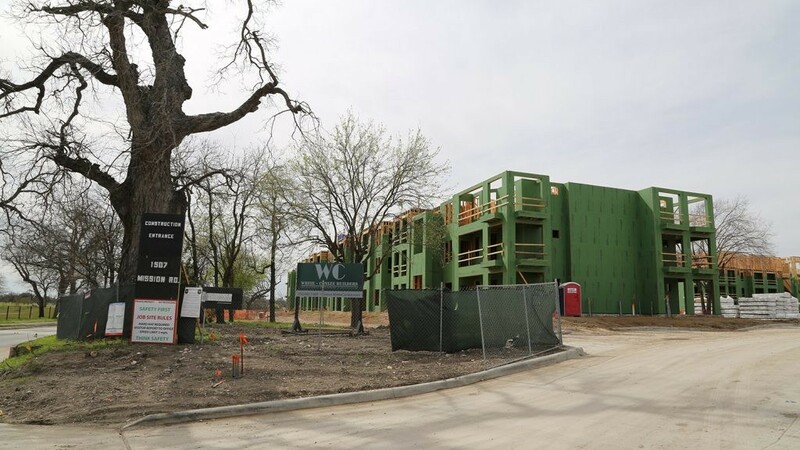 At Soap Factory, the new Houston-based owner, the Barvin Group, began upgrading the units, adding additional fees and hiking up the rent, residents have told the Heron in previous interviews. At least three Soap Factory households, including Galindo, have received relocation assistance from the city—either from federal dollars or from the city’s general fund—because of a rent hike. For Galindo, a $70 rent increase and extra utility charges, she said, brought her monthly apartment costs at Soap Factory to $970, an amount she couldn’t afford. 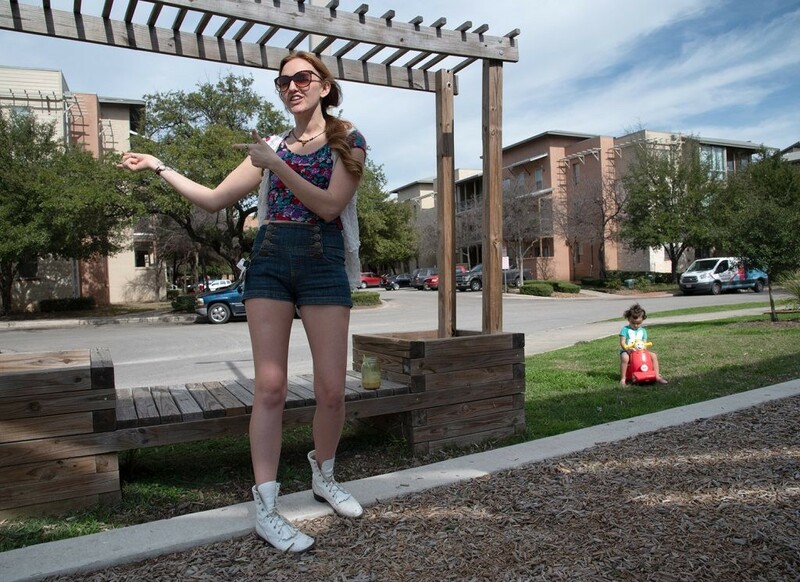 Three days before her lease ended at Soap Factory, she was considering staying with a friend when Refugio Place contacted her with an available apartment: a two-bedroom with a view of the Tower of the Americas for under $800 a month. Galindo considers the timing miraculous. From the general fund, the city gave Galindo $2,380, but the assistance didn’t come until after she moved. She had quit paying bills and used some of a student loan to fund the move until the city came through and paid her rent at Refugio Place from January through March. Galindo describes the time as “one of the most anxiety-ridden months of (her) life.” She said the process of receiving the assistance from NHSD was so dysfunctional—she said it took more than 20 phone calls to receive the assistance—she questioned whether NHSD was prepared for other Soap Factory residents who could be priced out of the complex. Currently, there are four pots of money—two federal, two from the general fund—the city of San Antonio uses to help people who are forced to move from their home. The risk mitigation fund, assuming the City Council passes it next month, would introduce a fifth pot. Since October, NHSD has held community meetings to get feedback on the policy. Galindo attended the meetings early on, but then stopped attending, calling them a waste of time. “(NHSD) didn’t use people who were being displaced, so they don’t even know what displacement looks like,” she said. Vallerie Hartfield (left) and Stephen Lucke discuss a question presented to attendees of a city-hosted displacement policy meeting Jan. 16 at the Ella Austin Community Center. Galindo wasn’t the only source of criticism NHSD received as it put together the risk mitigation policy. Many citizens involved with the process, and observers from afar, say the policy is helpful in what it’s designed to do, but focuses too little on preventing displacement. The same message is also coming from COPS/Metro, which isn’t necessarily coordinating with the Esperanza Center. Lourdes Menchaca, a member of COPS/Metro, said the organization has told NHSD the risk mitigation policy needs to be more preventive in its approach to displacement. NHSD officials, including Soto, have held firm in their stance that the risk mitigation policy will do what it’s intended to do: help those who need the help now. The Esperanza Center acknowledges that NHSD is listening. Its suggestion that the policy include people who are forced out of their deteriorating homes because of code enforcement violations was accepted and NHSD made the change. However, Yaneth Flores, an organizer with Esperanza, says there’s a disconnect between NHSD and other city departments, particularly Development Services and Code Enforcement. Soto and other NHSD officials have talked about a coordinated housing system that’s in the early stages that will address some of these concerns. The idea behind the system is to ensure city departments whose core function impacts housing are talking to each other. The effort would also reach out to external partners such as SAHA—with the goal of sharing data and eventually creating a housing dashboard. The Mission Escondida luxury apartments are being build by local developer White-Conlee at 1507 Mission Road. One of the key differences between the risk mitigation policy and the federal Community Development Block Grant (CDBG) dollars is the eligibility requirements; the local program is less stringent. For example, households making 80 percent of the area median income—which the U.S. Department of Housing and Urban Development defines as $53,440 for a family of four in the greater San Antonio area—are eligible for CDBG dollars. With the risk mitigation policy, households making 100 percent of the median wage—in theory, half of all San Antonio households—would be eligible. Also, only U.S. citizens can take advantage of CDBG dollars, whereas people living in San Antonio who are not U.S. citizens are ineligible. Under the risk mitigation policy, non-U.S. citizens could qualify for assistance. 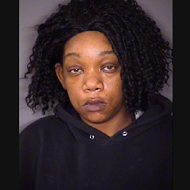 It adds another layer to what Nirenberg describes as a larger displacement strategy. 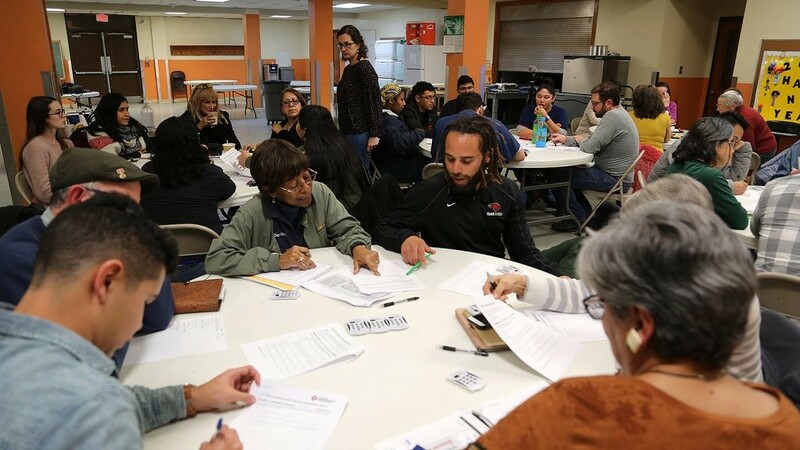 Late last year, as the City Council was mulling the CCHIP revisions, which were designed to add more funding for affordable housing, groups such as the Esperanza Center and COPS/Metro urged the council to delay the vote until a displacement study was conducted. At the time, city officials and the community groups argued over the definition of displacement in San Antonio. City officials acknowledged the former Mission Trails mobile home park on the South Side being uprooted for the Mission Escondida luxury apartments, which received $1.8 million in CCHIP aid, as an example of direct displacement. 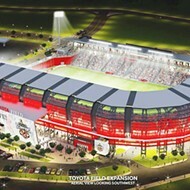 The city later changed CCHIP so no project that would directly displace people would be eligible. But officials wouldn’t acknowledge any form of indirect displacement, such as the kind that comes with increased taxes, the groups were talking about. Now, the CCHIP impact study is moving forward, but it’s too early to tell if NHSD or the Center City Development and Operations (CCDO) department will take the lead, Soto said. NHSD is also working on designating neighborhood empowerment zones within San Antonio. Under state law, a city can designate these zones, which offer what is essentially a freeze on the valuation of their property for 5-10 years, but only if the homeowner made improvements to their home. The idea is that home upgrades, which typically result in higher appraisals and therefore taxes, should not deter a homeowner from maintaining their home. At the Texas Legislature, Bernal is fighting to get HB 1102, which will freeze school taxes, enacted. He also filed House Bill 240, which would allow homeowners to pay their property taxes on a payment plan. 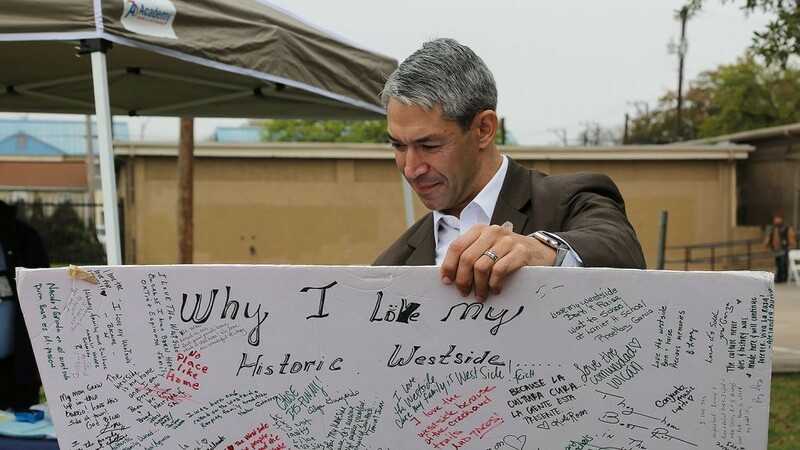 Mayor Ron Nirenberg reads a poster board at an Alazan Courts festival March 2. 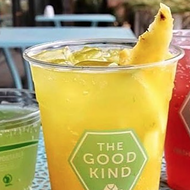 Gould, the West Side preservationist, has noticed two trends facing residents: San Antonio Property Maintenance Code compliance violations and residents selling their homes for low-cash offers. Last fall at a community meeting, Bernal asked attendees if they had received letters in the mail inquiring about selling their homes and nearly everyone raised their hand, Gould said. Many West Side residents call the Esperanza Center and the Historic Westside Residents Association (HRWA) asking for assistance, complaining about code compliance violation notices, Gould said. Some of the residents tell the Esperanza the city referred them to both organizations. Gould explained residents whose homes are condemned by the city, because they can’t afford the repairs, or to pay the code compliance fees, are eventually displaced. Fees range from $100 to $2,000—minimum costs are raised with each violation of an unaddressed issue, according to the city. Gould said some of the residents she spoke to, even those whose houses are not being condemned, sell their homes to real estate investment firms like Dallas-based We Buy Ugly Houses, aka HomeVestors of America, for cash which they then use to purchase or rent a less expensive home or apartment. These residents, who sell their homes usually for less than $25,000, have found it was not enough money to acquire sustainable housing, she said. 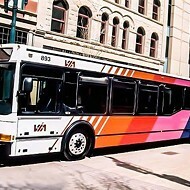 Because UTSA is expanding its downtown campus closer the near West Side, Gould believes a more comprehensive policy is necessary to prepare those older residents from the influx of new residents, new developments, and potential new businesses that will attempt to capitalize on the area’s eventual student-heavy demographic. She said more impact studies should be conducted in tandem with new development projects, similar to a study Christine Drennon, associate professor of sociology and anthropology at Trinity University, conducted on the former Wheatley Courts and East Meadows, the mixed-income complex SAHA built in its place. In a recent interview, Drennon talked about a form of displacement when large mixed-use or residential developments force out residents by changing the cultural and sociological elements of a neighborhood. Changing retail mixes in an area, where more upscale stores and restaurants are built, whether part of a larger development, such as the Pearl, or around a new residential complex, can cause people to move farther away to shop, eat, drink and socialize at places they can afford, Drennon said. Drennon also mentioned that developments, including city infrastructure that uses public funds, should be examined for how they will impact an area and its residents. One example could be an old warehouse on Tampico Street on the near West Side, which SAHA wants to convert into a 200-unit, mixed-income apartment complex. East of the property is a future segment of the San Pedro Creek Culture Park. West of it is Alazan Creek and a tiny neighborhood of about 35 homes. 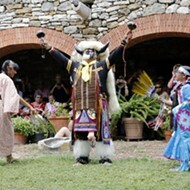 San Antonio Heron Editor Ben Olivo contributed to this report. 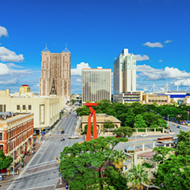 The San Antonio Heron is a nonprofit news organization dedicated to informing its readers about the changes to downtown and the surrounding communities.